The Mail on Sunday ran an article by David Rose a couple of weeks ago, pointing out just how woeful most climate models had been in predicting global temperatures in the last decade or so. Added to other media reports in recent months, the public at large, at least in the UK. are now gradually becoming aware that temperatures have flatlined for several years. Forecasts of global temperature rises over the past 15 years have proved remarkably accurate, new analysis of scientists’ modelling of climate change shows. The debate around the accuracy of climate modelling and forecasting has been especially intense recently, due to suggestions that forecasts have exaggerated the warming observed so far – and therefore also the level warming that can be expected in the future. But the new research casts serious doubts on these claims, and should give a boost to confidence in scientific predictions of climate change. The paper, published on Wednesday in the journal Nature Geoscience, explores the performance of a climate forecast based on data up to 1996 by comparing it with the actual temperatures observed since. The results show that scientists accurately predicted the warming experienced in the past decade, relative to the decade to 1996, to within a few hundredths of a degree. The forecast, published in 1999 by Myles Allen and colleagues at Oxford University, was one of the first to combine complex computer simulations of the climate system with adjustments based on historical observations to produce both a most likely global mean warming and a range of uncertainty. It predicted that the decade ending in December 2012 would be a quarter of degree warmer than the decade ending in August 1996 – and this proved almost precisely correct. The new research also found that, compared to the forecast, the early years of the new millennium were somewhat warmer than expected. More recently the temperature has matched the level forecasted very closely, but the relative slow-down in warming since the early years of the early 2000s has caused many commentators to assume that warming is now less severe than predicted. The paper shows this is not true. These claims raise a number of issues, but let’s start by looking at the actual numbers. Plotted below are the annual HADCRUT4 anomalies, (based on y/e August, in line with Allen’s workings). The decade averages, as indicated by the red lines, have increased from 0.196C to 0.467C, so on the face of it, Allen’s prediction was spot on. But we need to delve a little deeper. 2) The article also talks about “the relative slow-down in warming since the early years of the early 2000s”. This is more nonsense – warming has not “slowed down”, it has stopped. 3) The first thing to notice about Allen’s prediction is just how low it was, compared with most other models. His forecast of 0.25C warming in 16 years equates to about 1.5C/century, well below other predictions. We’ll compare a couple later. 4) His starting point, the 10 years ending 1996 were, of course, affected by Pinatubo. The years 1992-94 were about 0.15C lower than the years before and after, so it is reasonable to assume the decadal average was about 0.04C lower as a result. In other words, about a sixth of Allen’s prediction of a 0.25C increase is no more than a rebound from Pinatubo. 5) As there was warming between 1986 and 1996, the temperatures at the end of that decade were already higher than the decadal mean. The average of 1995/96 was 0.07C higher than the decadal mean. In other words, part of Allen’s predicted increase between 1996 and 2012 had already occurred before 1996. 6) By the time the paper was written in 1999, Allen, of course, already knew that temperatures had climbed significantly since 1996, with the average of 1997 and 98 being 0.46C. Remember that his model predicted a figure of 0.45C for the decade to 2012, (0.196C + 0.250C). I wonder why we were not told then that there would be no net warming for the next 13 years? 7) Although the model has, fortuitously, accurately predicted the temperature to 2012, this does not mean that it has been validated. The lack of warming for at least 10 years is a significant feature, and any model that fails to predict this cannot be said to be validated. It is ludicrous to posit that it “should give a boost to confidence in scientific predictions of climate change”. 8) As I mentioned, many other models forecast much more rapid rates of warming. The Met Office’s decadal forecast in 2007, for instance, which predicted global temperatures in 2012 would be 0.60C higher than 1996. 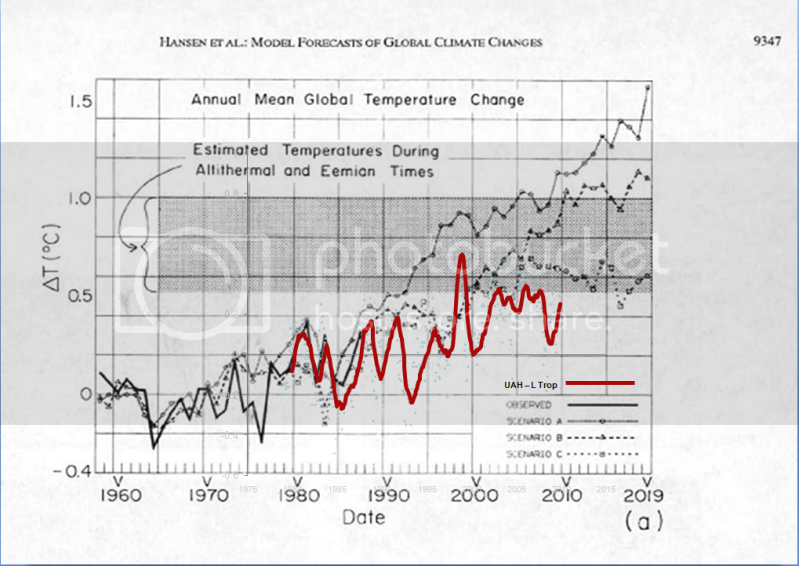 9) Or Hansen’s famous 1988 model, that predicted more than a degree of warming, even under Scenario B. Contrary to the Guardian’s claims, Myles Allen’s work does not indicate vindicate climate modelling in general, nor does it inspire confidence in current predictions. Furthermore, Allen’s work fails to explain why temperatures have flatlined in the last ten years, and why his original model did not predict it. More importantly, it has nothing to say about what this pause means for temperatures during the next decade. But you would not expect to hear any of this from the Guardian. Ah, The Guardian; never been known to look a gift horse in the mouth. Objective journalism is a foreign country to its Climate Change desk. Sad! Had a look at Allen’s lecture on this and either I am loosing the place or he is talking gibberish. H seemed excited about something but he seemed to offer neither evidence nor a coherent argument to support whatever his case was. Delighted to see Allen’s paper is having the scalded cat effect on denialism. I expect to see a lot of huffy, how-dare-he-say-that reactions over the coming days. Meanwhile no increase in temperatures for 10 yrs. For some reason, the Guardian seem reluctant to tell people this fact. These people are nothing if not brazen. But I think Mother Nature is going to determine what their limits are in this regard.